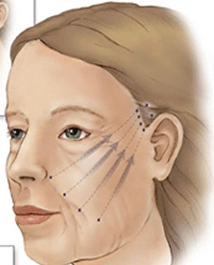 Oculoplastic surgery is specialised plastic surgery around the eyelids and face. It is also called oculo-facial surgery as the eyelids are continuous with the forehead, cheeks, and deals with the related tear system (lacrimal) and orbits (deeper structures surrounding the eyeball). Lacrimal surgery is specialised surgery on the tear ducts for watering eyes in children (congenital nasolacrimal duct obstruction) and adults, from whatever cause. Oculoplastic surgeons assess and distinguish the many different causes of watering eyes and carry out tear drainage surgery. Surgery often involves endoscopic endonasal approach which is a minimally invasive surgery. Oculoplastic surgeons train as ophthalmologists (eye surgeons) and then sub-specialise in oculoplastic surgery. They therefore have an in-depth knowledge of the eyelids, the eye and their function. We provide a comprehensive range of services for eyelid, tearing and orbital conditions in children and adults. The following are the medical conditions and aesthetic treatments that are commonly managed in our clinic. Oculoplastic surgeons also do aesthetic treatments and surgery on normal eyelids and surrounding tissues to improve or change their perceived beauty, including blepharoplasty surgery and botulinum toxin injections. As we age, the most noticeable changes are seen on the face. The bony structure of the face changes and we lose volume. This often results in sagging of the skin and wrinkle formation. Years of sun exposure and damage also add to the problem of ageing. Thankfully there are treatments available that can help to improve and rejuvenate the face either through simple non-invasive methods which have minimal discomfort or side effects, or with surgery to improve our appearance. Most of the procedures can be performed on the same day of the consultation, in the comfort of our newly equipped procedure room. These procedures often have minimal downtime and most patients can resume their usual activities soon after. At our clinic, a wide range of these treatments performed by our specialists Dr Elaine Chee and Dr Goh Swee Heng are available. Botox is a highly purified protein that is manufactured under stringent conditions. It has a long track record of more than 20 years. It has been used safely to treat unwanted wrinkles and frowns of the face. Wrinkles occur when we make repeated facial expressions from the contraction of our facial muscles. Botox can be used to target specific muscles to relax these muscles and hence eliminate the dynamic wrinkles. This results in a less wrinkled, more relaxed and more youthful appearance. The injections are done with a very fine needle by our trained specialists and treatment only takes about 10-15minutes. The discomfort and sides effects are minimal and the effect of the botox can be appreciated after 3-7 days. The effects of Botox can last from 4-6 months depending on each individual. As our skin ages, it loses it natural ability to retain moisture. This is made worse by chronic sun exposure and smoking. The face also loses volume and fat resulting in a more sunken appearance. Fillers containing hyaluronic acid (natural sugars normally present in the skin) can be used to fill up static wrinkles and scars in order to smoothen the skin surface. Fillers can also be used to replace the volume loss, resulting in a more youthful and rejuvenated appearance. Commonly treated areas include the laugh lines (lines along the side of the nose), the tear trough (sunken area beneath the eyebag region), marionette lines (lines from the corner of the mouth), jaw line and cheek areas. The injections can be done on the same day of consultation and only takes about 20-30minutes. The results can be seen almost immediately and the effects can last from 9-18 months depending on the type of filler used. Intense Pulsed Light (IPL) uses the property of non-coherent light distributed over a range of wavelengths for facial rejuvenation and hair removal. 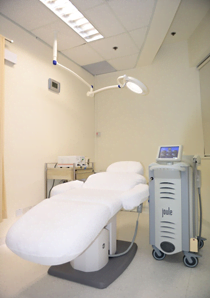 Our clinic uses the FDA approved BBL machine from Sciton. It is a relatively safe procedure for the overall improvement of skin tone and texture, improvement of pigmentation and reduction of fine blood vessel appearance. There is hardly any downtime with minimal side effects. Treatment can take from 15-30minutes and the results can be seen about 1-2 weeks after the procedure. For optimal results, maintenance treatment once every 3-4 weeks is advised. The Sciton STAR treatment offers a non-invasive combined approach to skin tightening and rejuvenation. It uses the BBL broadband light with the SkinTyte Infrared technology to effectively treat skin conditions associated with aging and sun damage. The SkinTyte infrared technology deeply heats the dermal (skin) collagen promoting partial breakdown and contraction of collagen. This promotes the body’s natural healing process and creates renewed collagen foundation leading to tighter skin and overall a more youthful appearance. This is an effective and gentle procedure with no downtime and the procedure can be performed in 15-30minutes. A series of 3-5 treatments, spaced about 4 weeks apart is the typical treatment plan for most patients. STAR treatments are safe for almost all skin types and can be performed on any area of the body where an improvement in the skin firmness, clarity and texture is desired. Popular areas are the face, neck, abdomen and hands. This treatment usually complements the surgeries that we perform to correct eyebags, droopy eyelids and mid-face lifting. With ageing, comes sagging of the skin and tissues of the face. These problems can be addressed by a minor clinic procedure that lifts the tissues of the face through a micro-needle with special re-absorbable cones. This procedure can be done in about 30 minutes under local anaesthesia. It not only provides a lifting effect, it has a regenerative action on the collagen, which helps to restore the lost collagen to give more definition and maintains volume over time. The effects of the thread lift can last up to 18 months. The procedure is performed by our trained specialists and can be performed as a stand-alone procedure or in combination with botox or fillers. 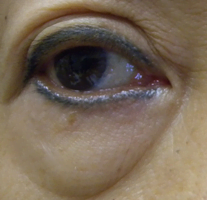 About 50% of Asians are born without a double fold in the upper lid. 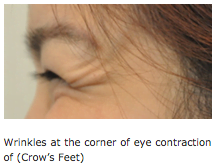 This can result in down-turned lashes which may occasionally touch and rub the clear part of the eye (cornea). A lack of a double fold may result in apparently smaller looking eyes. There are various methods which can be performed to create the double fold and improve the appearance of the eyes. Very often these procedures result in a brighter, refreshed look with bigger looking eyes. These procedures can be performed in our specialized procedure room within our clinic. Depending on the type of eyelid shape, skin thickness and presence of excess upper lid skin, our specialists will recommend the most appropriate surgery for you. This ranges from the non-incision method (stitches alone), to the small incision method to the full incision method. The non-incision and small incision method have a shorter downtime and can be performed within 30-45 minutes under local anaesthesia. As the skin and supporting structures around the eyes sag, the fat that cushions the eyeball can also bulge forwards underneath the skin of the upper and lower lids. This often results in the unsightly bulge beneath the eye, which we term as “eyebags” This often makes a person look older and more tired as it is often accompanied by dark eye circles as well. Surgery can be performed to remove the fat or reposition the fat to reduce the bulge beneath the eyes and smoothen and rejuvenate the area beneath the eyes. This can be done either through a scarless procedure from a hidden cut or through the skin just beneath the eyelashes should excess skin need to be removed.